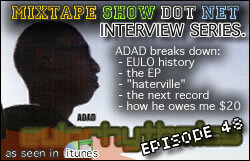 This entry was posted in episodes, interviews and tagged episodes, eulorhythmics, interviews, kenny keys, mc adad by dex digital. Bookmark the permalink. Loving the material! haven´t been this excited ´bout a new release in a while. “Kenny Keys is going to HURT some people!”. Can´t wait to hear the new stuff. Adad, whattup. I’m feelin the music.